How do you destroy a great educational institution? 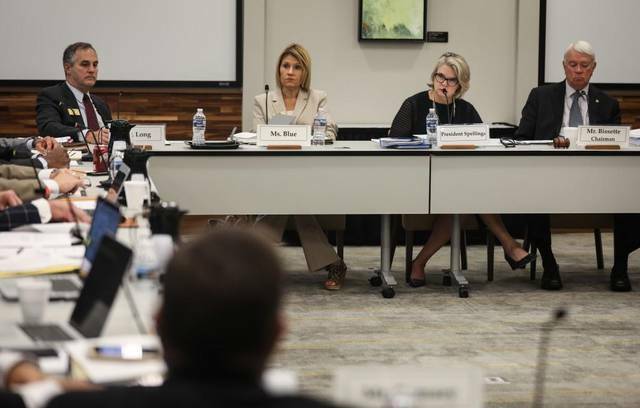 One 28-member Board of Governors at a time, when it's packed with political hardliners and hacks who care more about ideological posturing than they do about education. Spellings is 2nd from right. The University of North Carolina Board of Governors met yesterday, and a radical majority of right-wing Republican members -- almost all the members are Republican -- pushed through surprise resolutions that had not been shared in advance. The thrust of those resolutions was clearly aimed at undermining the authority of UNC System President Margaret Spellings, who was just appointed in 2015 (amid plenty of controversy). Jane Stancill captured the action yesterday for the News&Observer. Among the most destructive decisions was the vote to prohibit the UNC School of Law's Center for Civil Rights from pursuing legal remedies for low-income and minority groups or for individual citizens. As a result, the Center will close and pursue its activities elsewhere. The Center was funded entirely by outside contributions anyway. The BOG isn't saving money by smashing the Civil Rights Center; it's merely signaling its political hostility to equal rights. The cabbage worms are eating the cabbage from the inside out.